So, you guys know how I eat salads for lunch a lot, right? And how I spend a lot of time in the morning to chop/prep/pack said salads more often than not? I was treated to lunch at a local bistro/deli/restaurant/what have you by an old friend of mine last week. I knew I’d stick with salad so as to avoid an afternoon food coma at my desk (I’m like a child and if I eat a heavy lunch, either a nap or a terrible mood is imminent). I ordered a chopped salad with artichoke hearts, tomatoes (which I ate– who’s proud of me? ), roasted bell pepper, cucumber, goat cheese and a balsamic dressing. I pretty much licked my plate clean. But here’s the thing. As I was eating in my ladylike way, I kept thinking about how easy this salad would be to put together at home and for SO much less money. I mean, there wasn’t even MEAT on this salad and it was still $12. So I went to the store, stocked up, and now have a new salad obsession. 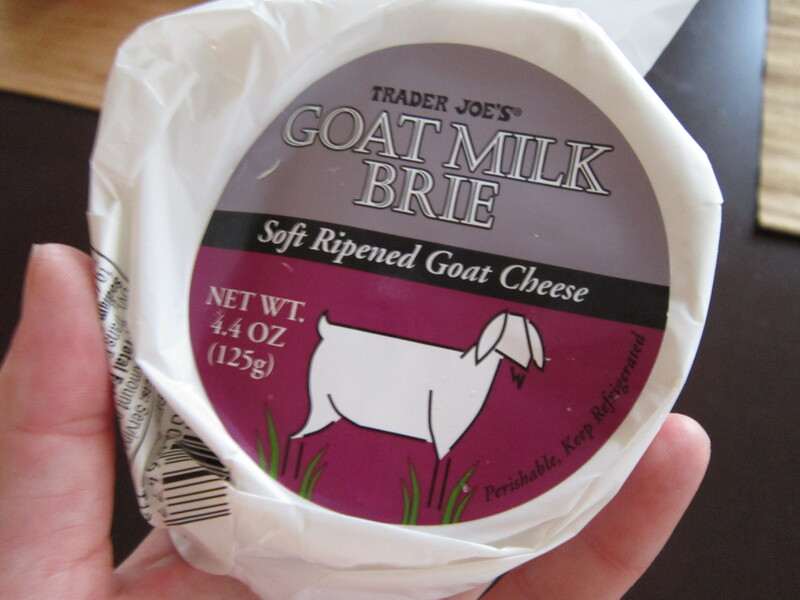 I’m not usually a goat cheese fan, but this brie is fairly mild. It still has that characteristic goat’s milk tang, but it’s not quite as shocking to the senses as a chevre, for example, would be. Plus, this little wheel was something like $2.49 at Trader Joe’s. I freakin’ love their cheese section. Of course, if you’re not a fan of goat’s milk you could crumble some feta, mozzarella or even blue cheese into your salad. This isn’t a recipe (use the proportions of each ingredient that you like), it’s simply my humble salad inspiration offering for the week. Go forth and brown bag your lunch, friends. This is why I hate ordering salads when I go out to eat – they’re soo overpriced I think to myself “I could make this” the whole time! Yours looks great. Love me some roasted bell peps! I very rarely order salad while out at lunch for the exact same reason. I can’t justify it when it can be made at home for less than a few bucks. Nicely done. I love salads like this. I bring them to work pretty much every day. They’re always gigantic and full of pretty much everything in my fridge. But using goat milk brie was a glorious idea. That stuff is wonderful. Why is it though that salads from a restaurant always taste better? The lack of effort? I love artichokes so much. I eat them straight from the can. They always make a salad better. And goat cheese is my lover. Goat’s cheese, mmmmm, my fave. Your a salad rock star. Seriously it’s the little things like this, delish. Your salads are always so damn pretty. 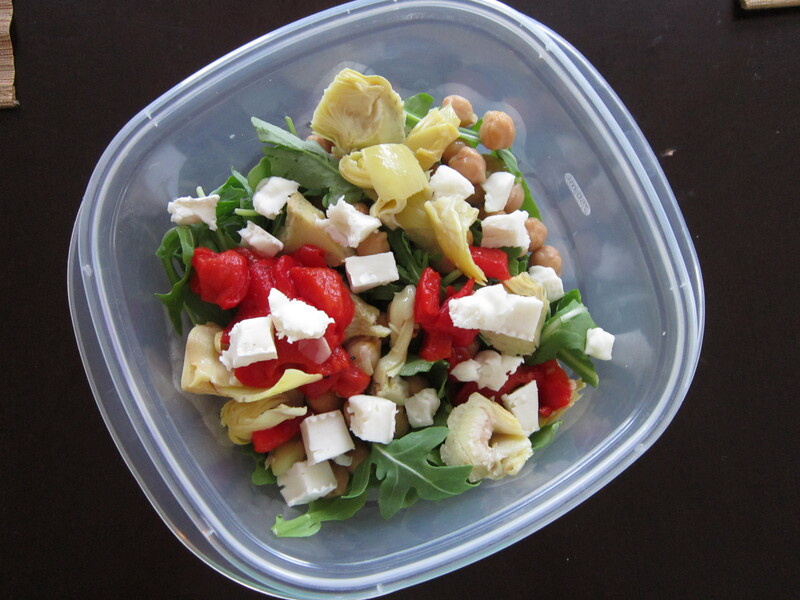 I’m so lazy – and always running late – so if I don’t pre-chop my veggies there’s no way I’m taking salad for lunch. 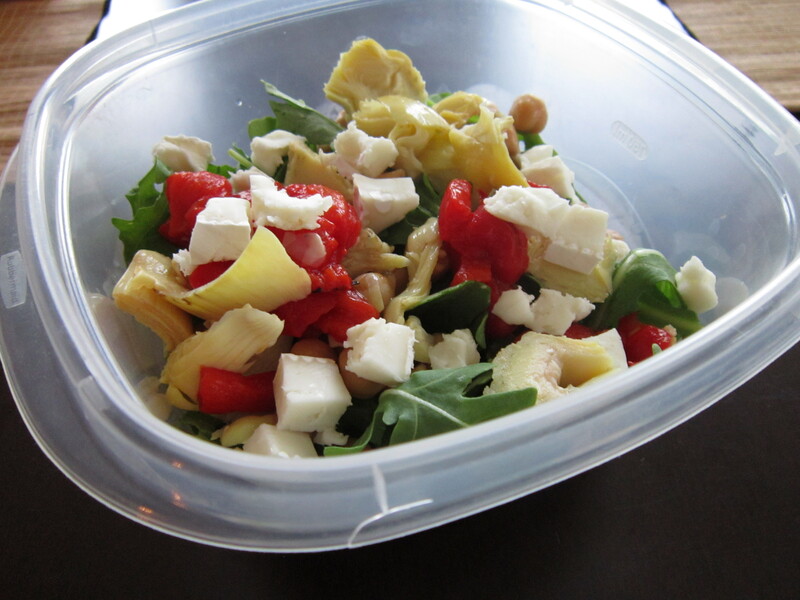 I need to be a bit more organized…Oh, and YES – goat cheese. My love for it goes deep. This sounds spectacular. I’m definitely a salad girl with my lunches, but I can’t lie- fall has me really excited for soup again… it’s the little things, i guess. Fall makes me excited for cheese dip and wings. If that’s wrong, I don’t want to be right. Goats milks works a lot better for me digestive wise. I looove salads, this one looks fantastic too! Goat cheese works better for me too! Billy is right on the money. Hope you are having a great Labor Day! Thanks, Ameena! Hope you had a good weekend, too!